The spring began with us continuing to develop material for our next performance, The Garden, to premiere at Philadelphia Community Farm in 2020. Over the past year we have been gathering the ensemble that will co-create The Garden, which coalesced this May. There will be 9 brave souls (more info about them forthcoming!) embarking on the journey to create this surrealist trip through an infernal underworld. We have paused our work on this for now, but will resume our work this fall at Soma Studios. 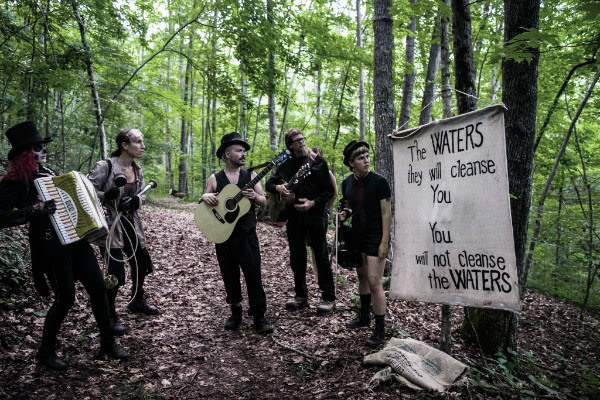 The summer began for us in Disputanta, KY, where we performed The Wastelands alongside excerpts of The Way at Midnight by Mondo Bizarro from New Orleans, and a work-in-progress showing of Ezell, by Clear Creek Creative. Our three companies were in residence on the land stewarded by Clear Creek Creative for 2 weeks, setting the scenes for our outdoor work and connecting with the surrounding community and each other. Our three pieces were shared back to back with meals in-between as part of a beautiful extravaganza we called the Summer Solstice Spectacle. This project was made possible, in part, through an Exchange grant from the Network of Ensemble Theaters’ Travel & Exchange Network (NET/TEN), supported by lead funding from The Andrew W. Mellon Foundation. The summer season will close for us the first week of October, when we will perform The Wastelands for what we believe will be the final time! (at least for awhile). 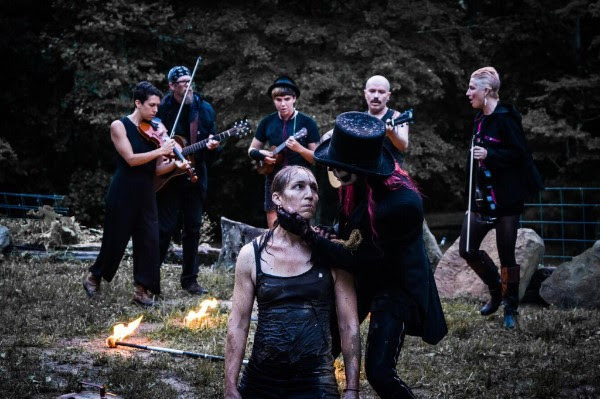 After these performances we will begin to immerse ourselves fully into the world of The Garden… so if you haven’t seen The Wastelands yet, or you have a friend/family member who you have been meaning to bring, now is the time! This performance is free and open to the public, but please feel free to bring cash for after when we pass the hat! At long last, we have an Open Flame website! 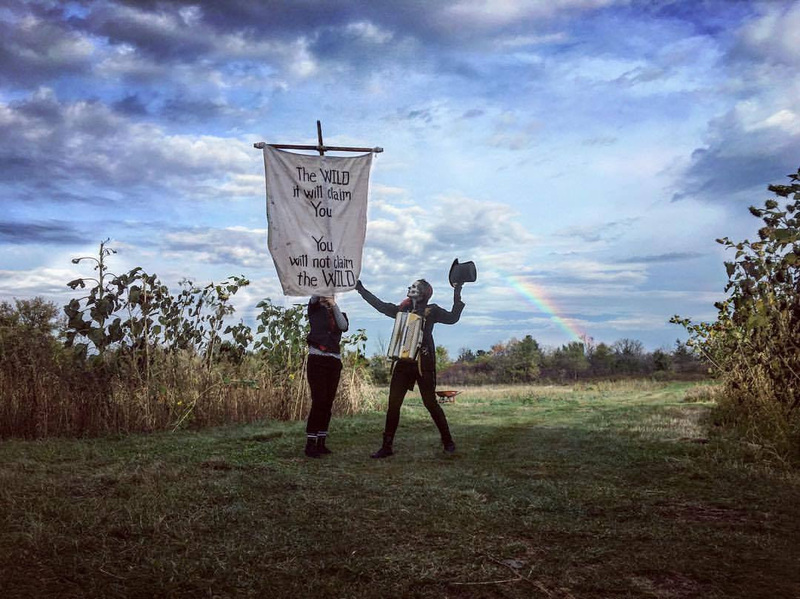 Check us out here to learn more about our history, read essays about our queer theatre, buy/listen to the music from The Wastelands, and in general stay up to date on what’s going on! Here is an excerpt from Scene 5 from The Wastelands! This excerpt is from our closing night in Kentucky, featuring performances by Walken Schweigert, Katie Burgess, Matthew Ryan Surline, Sea Thomas, Robert Rorrer, Rainbow Star, and Bethany Cook. Here is a work in progress excerpt from The Garden! Many thanks to the American Composers’ Forum for commissioning The Garden. 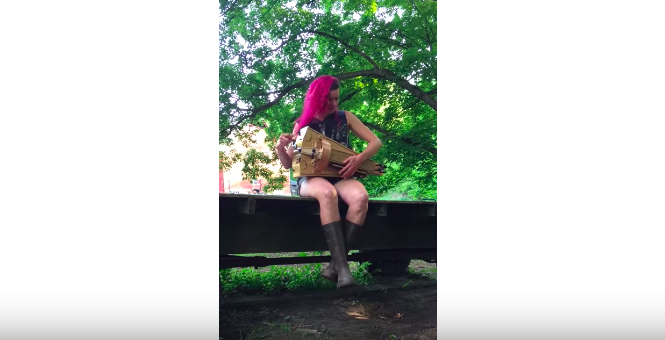 The hurdy gurdy purchase and subsequent compositions for The Garden are made possible by a grant from the American Composers Forum with funds provided by the Jerome Foundation. This hurdy gurdy was made by George Leverett of Altarwind Hurdy Gurdies! Walken Schweigert is a performer, composer and director from St. Paul, MN. He is the founder and artistic director of Open Flame Theatre, an all queer/trans ensemble that creates surrealist & queer-centered work. Walken is a 2009 graduate of the Dell’ Arte International School for Physical Theatre, and a 2006 graduate of the Perpich Center for Arts Education (Theatre Major). He has worked with the Taller Xuchialt and Ronda de Barro in Leon, Nicaragua; toured with and been mentored by the internationally renowned Double Edge Theatre in Ashfield, MA; and has busked on the streets of 11 countries. A classically trained violinist, he has been part of over a dozen musical ensembles of varying genres, from klezmer to metal. Walken was also recently the recipient of a JFund award from the Jerome Foundation via the American Composers’ Forum for the composition of his second opera, The Garden, to be produced by Open Flame Theatre and Philadelphia Community Farm.